Since our anniversary, my birthday, and Greg’s birthday are all within about 2 weeks of each other, we attempt to get away and celebrate ‘grown-up style’. This means, at least one night away…with NO children, dressing nice (which I did, but had to change because it got cold), eating out, and doing something fun. This year we returned to Branson, MO, and had a wonderful time…again. It did rain the entire time we were there, but we enjoyed ourselves regardless. As most of you know, I am ‘frugal’ so, after searching online for a decent hotel for a good price, I stumbled upon the Scenic Hills Inn. 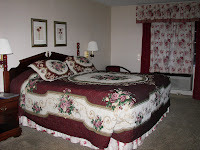 At first, I planned on booking a regular room because they had good reviews, and on their website they appeared to be nice and a good price (under $50 +tax). 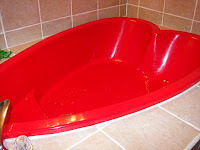 Then I noticed for about $35 more, I could have a jacuzzi in the room. How could I resist? I, of course, announced a disclaimer to Greg as we were arriving at the hotel, ‘If this place isn’t what we are expecting…it’s not my fault. You okayed it! And…you left all the planning up to me…AGAIN!’ I can honestly say that every get-away/vacation I have planned has been a raving success…this was no exception. The room was very nice (smelled a little stuffy, but not bad), the bed was very comfortable, and the jacuzzi was wonderful (a little noisy, but that was to be expected). We plan on booking that room again next time. 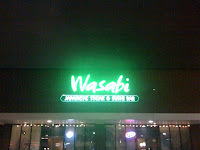 For dinner, we once again visited Wasabi. 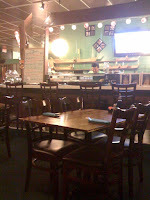 They had remodeled a little on the inside, and the food and service was fantastic. I had been looking forward to eating ‘real’ sushi this year, and decided on a spicy tuna roll. I was a bit nervous at first, but LOVED it! 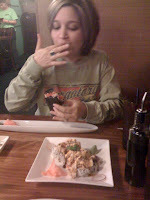 I also had to order California Rolls which were as awesome as I had remembered. 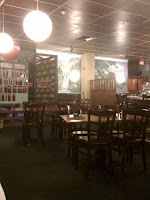 We avoided Saki this year…once was enough for me. After dinner, we stopped at Walgreen’s and picked up some ice cream. 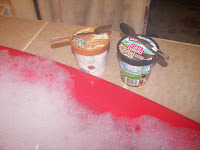 We headed back to the hotel, where we enjoyed a romantic evening filled with laughter and eating ice cream while relaxing in a steaming jacuzzi overflowing w/ bubbles. 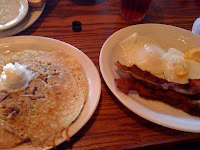 Breakfast took place at the Cracker Barrel (also one of my favorites), and everything was delicious. My eyes were bigger than my belly, and Greg finished off his breakfast plus about half of mine. He then drove me to Michael’s…a store that if I lived closer, the employees would probably know me by name…where I bought little goodies for the kids and a couple things for me. Finally, we drove home (in the rain…still), and just talked about our life. We are beyond blessed. I am so thankful for a husband with dreams, ambitions, and goals. We are in sync on most of what we want out of our life, things we want to accomplish with our time. 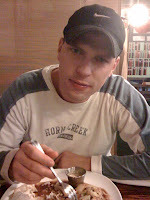 I can truly say I am happy, and am totally in love with my husband. We had a wonderful time in Branson, and I look forward to many more birthdays where we can celebrate the year. Not just the laughter, but also the tears…not just the accomplishments, but the failures as well. You have to take the good with the bad. Life is good even when you think it stinks because God has a plan, and it’s bigger than yours.